Smoking and drinking have been paired together for years. For somebody who does not smoke, I sure have an abundance of ashtrays, cigar cutters, lighters, match safes, matchboxes, matchbooks, and match covers—the tools of tobacco that have been used for years to advertise beer. America is dotted with the corpses of old breweries. You might have passed them while driving through some forgotten inner-city neighborhood: brick-and-mortar behemoths, four to five stories high, sometimes with gaps in the wall where copper brewkettles and other objects of value were extracted. Like it or not, taxes are a fact of life (or death, as some would say). They have been imposed on citizens by governments for centuries, and breweries and their beers have long been a favorite tap for government revenue. Columbus, Cortez and Coronado all showed up in Mexico looking for gold. What gold they did find, they traded for smallpox, syphilis and mercury poisoning. Thanks, guys. 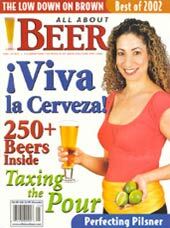 It wasn’t until the 20th century that a friendlier gold was discovered in Mexico, a lustrous liquid gold—cerveza! The old saying that only lawyers get rich has never been more true where the protracted legal wrangles between Anheuser-Busch in the United States and Budweiser Budvar in the Czech Republic are concerned. England’s individual beer styles are a result of the golden age of English brewing, the 18th and 19th centuries. Brown ales sit right in the middle. They are unassuming, working-class brews. Imminently drinkable, rich with classic English character, and midway between pale ales and porters, brown ales are ready and able to slake any thirst. We have a friend who is devoted to blues—music, that is. For years he has been talking about traveling to Memphis and then heading south into the Mississippi Delta for a tour deluxe, visiting historic spots and listening to the blues in steamy juke joints.